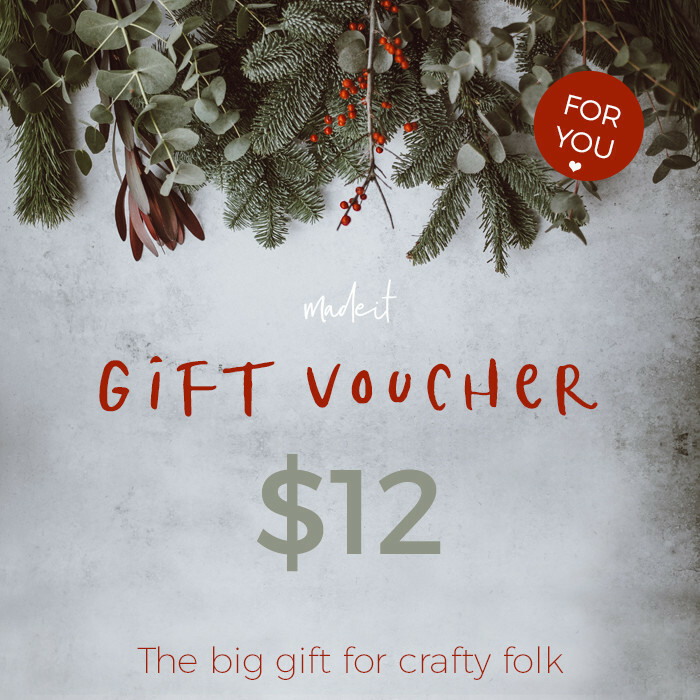 Give the biggest gift to crafty folk this Christmas, with an e-Voucher for their very own Madeit store! If you do not provide a send date, your voucher will be sent to the recipient at midnight 24th December 2018 (AEDST). eVouchers are manually created and scheduled for electronic delivery so please provide at least 5 business days notice of your preferred send date to avoid risk of late delivery. * Recipients will require a valid Mastercard or Visa in order to create a subscription and will be provided a coupon code valid for a single use up to the dollar value prescribed, that must be applied when creating a subscription. * Vouchers are valid for 5 years and pricing and availability of plans outlined above are subject to change. * Subscriptions are set to auto renew by default, but once subscribed, recipients may set their subscription to cancel at the end of their current billing cycle so no further spend is required. * Recipients will need to acquire (if they don't already have one) a business PayPal account in order to operate their Madeit store. They do not need a registered business to hold a business PayPal account and holding the account is free, but fees transaction fees will apply for sales using this payment method (see PayPal website for details). *eVouchers are valid for use by Australian residents only, and all products sold on Madeit must comply with the restrictions outlined in our website Terms and Conditions. Our website terms and conditions apply to the operation of a store paid for by voucher, and general use of the site at all times.